EUR/USD once again seems to have failed at the $1.3100 level and, this time, in quite spectacular fashion. The currency pair dropped 100 points yesterday to close at $1.2966, its biggest daily fall since the start of November. It is seeing further weakness already this morning. The euro didn't benefit in the slightest from Mario Draghi's bearish comments on the Eurozone economy yesterday. There is now an increased likelihood of a rate cut early next year. The EUR/USD pair seemed to hit some resistance at the $1.3100 level yesterday, falling 25 points to $1.3066, which was the only real downside move for a couple of weeks. The fall came after weak Eurozone data and a disappointing Spanish bond auction convinced forex online spread trading investors that the euro had risen too far too quickly in recent weeks. The euro continues to push higher against the dollar, reaching a seven-week high, as Greece earned a two year extension on its deficit target from the EU. Ultimately, the EUR/USD pair advanced 40 points to close at $1.3093. Across the pond, the Democrats and Republicans both seem to be adopting tough stances when negotiating the budget, also causing the dollar to weaken. The euro hit a six-week high against the dollar yesterday, rallying 70 points to $1.3053. The single currency was supported as Greece offered to buy back €10 billion of bonds in what is seen as a sign of progress in its bid to tackle the debt mountain. Strong manufacturing data from China overnight also helped the EUR/USD pair, as signs of improvement in the global economy prompted traders to invest in riskier currencies. 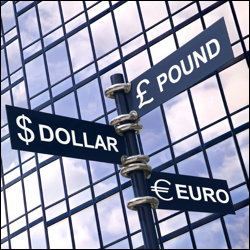 In FX spread trading, the EUR/USD remained unchanged on Friday, closing at $1.2955. In the early part of the session, the dollar traded lower against the world's major currencies after a multilateral lending deal for Greece was approved by Germany. The dollar recouped these losses later on as fears for the US budget negotiations re-ignited demand for the dollar. Early forex spread trading on Thursday saw the euro/dollar reach a one month high, before Republican John Boehner ruined the mood. He suggested that there had been no substantive progress made in the last two weeks, an almost complete contradiction to the positive comments he had made the day before. The single currency fell on this news, but did recover enough to remain 17 points higher by the close. This morning, the bulls are out, pushing the single currency back above the $1.3000 level to test resistance near $1.3010 as I write. EUR/USD was largely unchanged yesterday, remaining around the $1.2950 level. In earlier trading, the pair fell to $1.2880 but recovered later on as a result of positive remarks made by major party leaders. This sparked a bit of risk-on attitude towards the single currency and resulted in a sell-off for the dollar. This morning, EUR/USD is trading at $1.2975, just being bid higher on the back of the decline in Spanish 10 year yields. In forex spread trading, the EUR/USD pair continues to decline after last week's gains, losing another 25 points yesterday and closing at $1.2944. Despite some strong US data, spread trading investors were in a risk-off mood because of concerns over the fiscal cliff and the OECD's downgrade to global growth forecasts. This morning, the single currency has maintained its weakness, currently trading at $1.2935, with near-term support and resistance at $1.2895/65/35 and $1.2955/95/1.3010 respectively. After the recent rally, the EUR/USD pair moved sideways yesterday, as investors waited for news from the IMF and EU policymakers. This saw the pair rise slightly to settle at $1.2985. In the Eurogroup press conference, the Greek government were praised for their efforts, but it has been recognised that the Greeks will have to meet tough goals with an ever deteriorating economy. As a result, we are seeing a little bit of profit-taking creep in this morning, with the EUR/USD spread trading market trading at $1.2970 at the time of writing. Better-than-expected economic figures in Europe and a greater appetite for risk assets helped the EUR/USD pair finish the week near its high at $1.2970. Forex spread trading investors also seem to be confident that European politicians will announce a decision regarding the Greek debt crisis today.